Award’Dr. Paul Jukes, President & CEO of The Jukes Group, recently received the William H. Spurgeon III Award in recognition of outstanding service to youth through Exploring. The William H. Spurgeon III Award is the highest recognition for individuals and organizations contributing significant leadership to the Exploring Program. 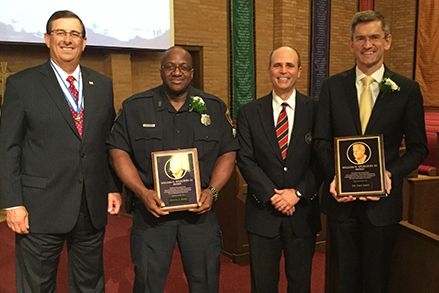 Dr. Paul Jukes was presented with the Award, along with another recipient Sargent Denito Berry, at a ceremony at Chapelwood United Methodist Church in front of 300 people. Dr. Jukes is currently the Chairman of the Exploring Committee for Houston and a Vice Chair & Director for the Sam Houston Boys Scouts of America (BSA).